Dome Top container for high-volume refuse collection. Openings on all four sides for convenient refuse collection. Optional decorative panels let you change the look to match the surroundings. Hinged hood with a stay-open strap for easy access to rigid liner. Rainhood cover allows for year-round container use. Available with ashtray for smoking areas. Optional locks. 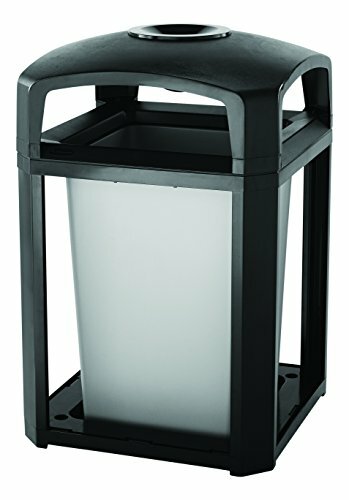 Rubbermaid Commercial FG397001BLA Landmark Series Classic Decorative Outdoor Dome-Top Refuse Container Frame, , 35-gallon with Ashtray, Black. Dome Top container for high-volume refuse collection. Openings on all four sides for convenient refuse collection. Optional decorative panels let you change the look to match the surroundings. Hinged hood with a stay-open strap for easy access to rigid liner. Rainhood cover allows for year-round container use. Available with ashtray for smoking areas. Optional locks.